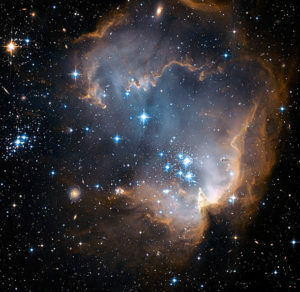 Consciousness Influences Energy and Gives Shape to Our Universe. “Consciousness! Ah ha! He’s talking about us, Sadie.” Yes, but there is more to consciousness, Horatio, than is dreamt of in your philosophy. Just ask Helena. For years great thinkers like Helena and Pierre have been telling us that every thought has an impact, but what is the mechanism through which a thought can have that impact? Theoretical physicists have come up with a theory that just might offer something in this area. We generally believe that atoms make up things around us, and that atoms have electrons spinning around a nucleus of protons and neutrons. Along the way the physicists decided that those particles are made up of even smaller particles called quarks. So far this is not a useful model. In this theory, there are infinitesimally small, vibrating strings of energy within the quarks. Originally it was thought that all the strings were loops. Later they decided that most are open ended and stuck to our universe. The rest are loops, and are free to move about. Gravitons are thought to be of the loop variety. It is thought that their free moving nature might help explain the conundrum that while gravity appears to be a weak force, it is ubiquitous and seems to play a much stronger role in things. How does this theory help my dilemma? To me, thought is energy, and as such can mingle with and influence other energy. Also, these strings are very small, and I don’t think our thoughts have much oomph to them. So the concept would be that thoughts impact small vibrating strings of energy to organize and give shape to things! Any Dean of Physics reading this is probably feeling lucky at this point that C. A. Knutsen didn’t attempt to do graduate work at their university. There are additional helpful things from M-Theory. Those who went down the path of String Theory were actually in search of one theory that unified all the forces in our observable universe–Strong Nuclear Force, Weak Nuclear Force, Electromagnetic Force and Gravity. String theory seemed to meet the need, but its mathematics required there to be six additional dimensions, which were closely associated with our three Cartesian dimensions. These six dimensions are not observable, but they dynamically move in tight patterns around our three familiar dimensions for a total of ten dimensions. 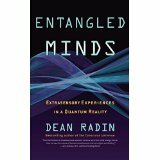 Ultimately an eleventh dimension was needed to reconcile the many versions of string theory that emerged. As a fiction writer, the first six additional dimensions don’t offer much latitude for imagination. They seem to have so few degrees of freedom that a writer of science fiction can’t fit much into them unless writing another Tron-like book. The eleventh dimension does not seem to be so constrained, and that is fascinating. What does this have to do with the Janus Unfolding Series? It is shaping my thoughts about the next book in the series. 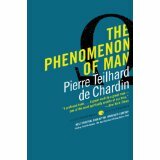 *Actually there isn’t a separation between the observer and the observed, but I do like the spirit of Mr. Teilhard de Chardin’s quote. This entry was posted in Janus Unfolding Scifi Series on December 19, 2017 by coreykn. I really liked the book. It was an exciting story set in the not too distant future. There are well described and choreographed space battles. The mysterious foes out maneuver all the good guys, but the heroine’s faster reflexes allow her to survive. I really liked the author’s treatment of the science. He consistently kept within the bounds of plausibility and explained things in an easily understood way. In the book a scientist has come up with a way to get around the solar system more efficiently and possibly travel to the stars. Without going into spoiler details, I like what he came up with. It is akin to what I use in my Janus Unfolding series, only he uses machines and I use minds. The other aspect of the story that is interesting is the mysterious opposition: what they do and why they are doing it. It’s a new twist on an old theme that I found fun to uncover as I read the book. 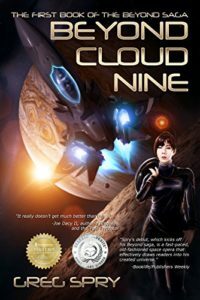 Shortly after I read Beyond Cloud Nine there was an announcement about a mysterious Planet Nine that is postulated to be beyond Neptune. No one has detected it, but the scientists say that a planet with ten times the mass of earth, 155 billion miles away would be the best way to explain certain eccentric orbits of other objects in the Kuiper belt and explain why the sun’s axis is tilted relative to the plane of the other planet orbits. There were a number of articles, but I thought this one by John Timmer, the science editor at Ars Technica described it well. I’ve provided the first couple of paragraphs and a link to his article if you want to look into I further. 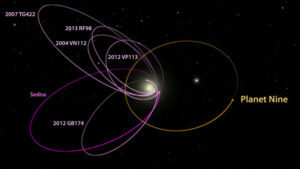 The possible ninth planet could explain a tilt in the Sun. Calculations suggest a Solar System oddity could be due Planet 9. Ideas about a possible ninth planet have been kicking around since shortly after we discovered the eighth in 1846. 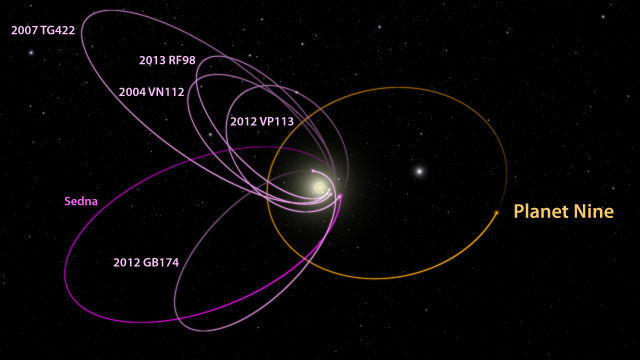 But so far, all that we’ve come up with is Pluto and a handful of other objects orbiting out in the Kuiper Belt. And these dwarf planets simply don’t have the mass to have a significant gravitational influence on our Solar System. But our inability to find anything big beyond the known planets may just have been because we weren’t thinking radically enough. One of the people responsible for the discovery of a number of Kuiper Belt Objects noticed an odd alignment in their orbits. When running models of how that oddity could be produced, he and his team found that a large planet with an extreme orbit would work. Calling it Planet 9, they suggested it could be over 10 times Earth’s mass and so far out it takes 20,000 years to complete one orbit. Planet 9, they speculated, has a lopsided orbit that’s tilted relative to the other planets and much closer to the Sun on one side. This entry was posted in Emergence: Janus Unfolding Book One on October 23, 2016 by coreykn. You will find several themes in Emergence and the Janus Unfolding series each with its own source of inspiration. Foremost is the mysterious Jim Post in Emergence. The mystery and the and the beginning of the book came to me in a dream. A wealthy and mysterious man had built a grand home in Southwest Washington State in our near future. The locals knew nothing about him. The home was on fire, and burning so hot that the fire department couldn’t put it out. When the fire finally burnt itself out, there was little left of the house, and the fire crew found a body inside. When I woke the next day, I started to write about the man and the mysteries surrounding him, including about whether it was his body they found. The book and series developed around additional themes. Evolution is a prime one. What would you do if evolution took a turn to develop a better model of human and you found that you were one of them? What would you do if you found you weren’t? When we think about evolution, it is usually about what has happened in the past. What will happen in the future? Technology and Social Media are making changes in our lives, but what about the basic human. There were a number of different hominids in our past, and our model emerged to be the dominant one (with traces of the others in our DNA). Is that it? Does evolution stop with us as we are? Why not a new and better model? The new humans might have readily identifiable improvements: a little stronger and maybe faster, physically. Perhaps they could reason better and faster as well. What more would they have, and where would these other abilities take the human race. I’ve taken the liberty to stretch the concepts I found a number of books. 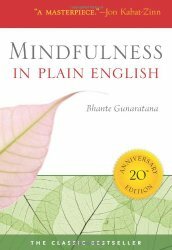 Three that stand out are: The Phenomenon of Man, by Pierre Teilhard de Chardin, Entangled Minds, by Dean Radin, and Mindfulness in Plain English, by Henepola Gunaratana. Also I found the ‘k-space’ notion in James P. Hogan’s The Genesis Machine helpful. Of course, when thinking about an evolutionary change, one wonders what triggered the change. The characters in Emergence and the other books of the series Factotum and Inheritance are curious about that, too. I must warn you in advance, that my books create a hopeful scenario for our common future. This entry was posted in Emergence: Janus Unfolding Book One and tagged emergence, entangled, evolution, Factotum, Inheritance, inspiration, mindfulness on September 7, 2016 by coreykn. The promotion of the eBook Emergence ran from 8/22 to 9/5. Here’s the results and what I learned. The price on Amazon and Barnes & Noble was lowered from $3.99 to $0.99. For a fee, twenty different services sent an email to their clients on a designated day during that period announcing the discount and two others sent out dozens of tweets about the discount. 379 copies of Emergence were sold for $0.99. Happily also about 20 copies each of the other two books in the series, Factotum and Inheritance, were also sold at the regular price. Thirteen Emergence eBooks were sold on Barnes and Noble, all the rest of the sales were on Amazon. Three book reviews of Emergence were posted on Amazon. One of the reviews had 2-stars from a person who never rated anything higher than 3-stars. The other two were 5-star reviews. It was difficult to assess the effectiveness of each of the services. One pattern that seemed to emerge was that the emails were far more effective than the tweets. The fees for these services exceeded the revenues by quite a margin. In an effort to reduce the gap in the next discount promotion later this year, some services whose email presentation did not look good and the sales on their day were low will be dropped. One service that exceeded my expectations in terms of the service they provided was It’s Write Now. They sent out the promised email announcement. They also tweeted the announcement and they set up and published an author interview which thought was well done. I’ve added the interview to my website. The hope was that revenues would at least cover the fees. That didn’t happen, but having so many people read my books is a good thing. It was also heartening to see that some who purchased Emergence also purchased the other books in the series and it would be great to see more of this as people finish reading Emergence. Also, getting reviews is a very helpful outcome. Hopefully more will come as people finish the books. Another very good outcome is that Emergence has been in the top 100 hundred best selling books in the Amazon category Kindle Store > Kindle eBooks > Children’s eBooks > Science Fiction, Fantasy & Scary Stories > Science Fiction during this entire promotion. The highest it has been is #6, it has been #20 or lower during much of the time. One more item of note is that a Goodreads giveaway of Emergence paperbacks was set up to end on 9/1. When that ended, the 643 people who did not win a copy in that giveaway were notified of the eBook discount. 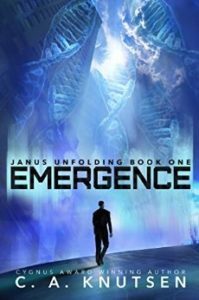 This entry was posted in Emergence: Janus Unfolding Book One and tagged Author Interview, Book Review, emergence, It's Write Now, promotion on September 6, 2016 by coreykn. 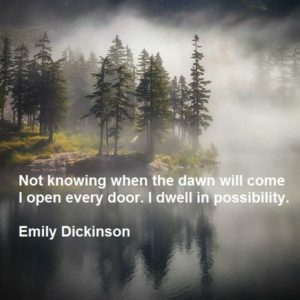 The quote from Emily Dickinson in the photo below is typical of posts I started making this week in response to Shari Stauch of Where Writers Win, who suggested I post on Twitter at least once a day. I was searching for content. I posted one of my book covers occasionally with a quote from that book. Too much of that is spam. I knew I had to look elsewhere for additional content. So I made my own. People responded favorably to the posts. I began getting more followers on Twitter and likes and comments on Facebook. One person on Facebook ordered all three of my books in response to the posts on the day I used the Emily Dickinson quote. The positive response is wonderful, but the most beneficial outcome from the effort has been the feeling I get from creating something beautiful and from the quote lodging in my mind as I approach my writing for the day. Scrivener – I have been writing in MS Word. I wrote chapter descriptions, chapters and character descriptions in separate Word documents and kept them all in a file folder. The process was a little awkward, but it was working. A few authors mentioned that they use software called Scrivener. I gave it a try. It doesn’t have all the features that Word has, but it has an organization scheme that keeps all those separate files in outline form on the left while you are writing. It took a couple of days to learn Scrivener and to wrestle into a form that would work for me. I’m going to use it for my fourth book. 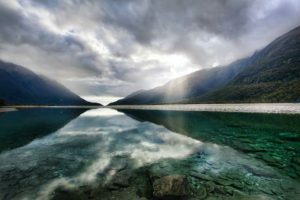 This entry was posted in Author Notes and tagged dickinson, emergence, evolution, Inheritance, science fiction, Scrivener on August 2, 2016 by coreykn. I have been talking about the need for reviews to set the stage for a promotion of Emergence. Thank you for the reviews! I have set the dates. The Emergence eBook will be discounted from $3.99 to $0.99 from August 22 to September 5. I have made arrangements with 20 services to send out a notice to their email lists on various day during that period. People on these lists are eager to get free or discounted eBooks. The combined number on these 20 different lists is several hundred thousand. Besides sales of Emergence, this process will raise visibility of the Janus Unfolding series and possibly create sales of Factotum and Inheritance. 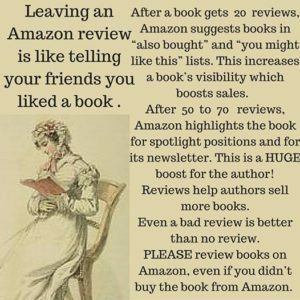 Also, there may be additional reviews which is always a good thing. This is my first time through this. I hope it yields fun results. 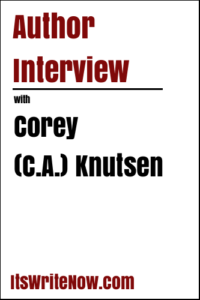 This entry was posted in Author Notes, Emergence: Janus Unfolding Book One, Janus Unfolding Scifi Series and tagged Factotum, Inheritance on July 26, 2016 by coreykn. We’ve all heard of Writer’s Block – where a person has a hard time getting their writing started. I just went through a session of Writer’s Logjam. I am beginning the next book, which is set in the Janus Unfolding world. I had a dozen or so ideas and they all wanted to be first in line, sort of like logs floating down the river and getting jammed together. I broke through the logjam and am in the third chapter. This entry was posted in Emergence: Janus Unfolding Book One on July 26, 2016 by coreykn. Book Covers – I went to Jeff Brown Graphics and asked Jeff to create new covers. Jeff is very creative and great to work with. They’re shown here and also make a fine new header image for the website. Perfect the product – I asked Sara Stamey, award winning author of The Ariadne Connection and Islands for editorial assistance. Social Media and Branding – I asked Shari Stauch of Where Writers Win to help me create a social media platform. This work is still under way. I also subscribed to the WWW Winners Circle which gives you access to a great deal of information about reviewers, book clubs and other helpful things. Promotion Strategy – James Wells, award winning author of The Great Symmetry, made a presentation at CAC16 about marketing eBooks. It was clear and actionable. Reviews – The services I will use to help with the promotion strategy look at the author’s online presence and the number of reviews. Some of the services don’t require any reviews, some require a minimum of ten and some require more. I had three at the end of May. The number is growing slowly and I value each new review. Thank you for the reviews! This entry was posted in Author Notes on July 18, 2016 by coreykn. I will be attending the Chanticleer Author’s Conference April 29 – May 1. It is at the Bellwether Hotel in Bellingham, Washington. At the awards event on the night of April 30, I will receive the Cygnus award for Janus Unfolding: Emergence. Attending authors can present their books for sale during the conference and at the book fair open to the public on May 1. The book sales are managed by the staff of Village Books of Bellingham. I will have all three books of the Janus Unfolding available for sale. 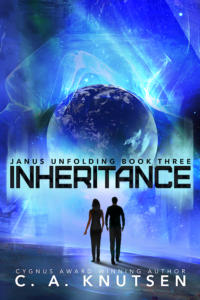 Book three, Janus Unfolding: Inheritance will be released as a paperback and eBook just ahead of the Conference. Hope to see you there! This entry was posted in Author Notes on April 5, 2016 by coreykn. 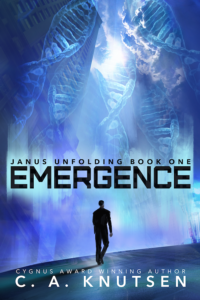 Janus Unfolding: Emergence has won the Cygnus First Place Award for Speculative Fiction. This is one of Chanticleer’s most competitive writing competitions. It’s wonderful to get this recognition. This entry was posted in Emergence: Janus Unfolding Book One on March 14, 2016 by coreykn.